In the words of James Taylor, “Summer’s Here”, which means the season of corporate fun days, summer fetes, end of term discos and, of course, weddings is upon us. 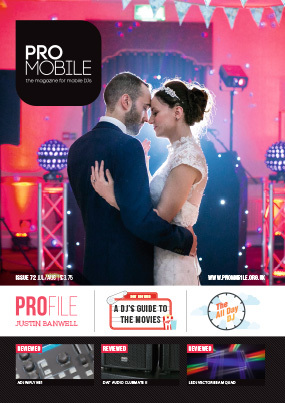 In this edition of Pro Mobile, amongst a whole host of other mobile DJ-related articles, reviews and regular features, we’ve got a piece dedicated to weddings. In it Toby Oakley discusses the phenomenon of the ‘all day DJ’ and offers advice for those interested in following that path. Elsewhere in the magazine we have articles of interest to all DJs regardless of the types of function at which you play. In a welcome return to the pages of Pro Mobile, Derek Pengelly offers advice on making your welcoming introduction, explaining why You Only Get One Chance To Make That First Impression. Meanwhile, our very own Marketing and Communication Manager, Sara Walker, shares her experience and advice for crafting a successful advertising campaign. A second generation mobile DJ, full-time professional Justin Banwell shares his story of over 25 years on the road and offers his advice for aspiring DJs. Richard Lee joins together his passion for music with his love of films in this amusing article. In this insightful article, Derek Pengelly explains why an effective welcoming announcement is essential to command an audience's attention for the rest of the event. Mark Walsh outlines the dangers of driving tried and offers advice on how to avoid them. What exactly is cheesy music? And how to deal with clients who don’t want it played at their events. Is Becoming An All-Day Wedding Host Right For You? Is becoming an all-day wedding host right for you? Toby Oakley outlines the pros and cons. Sara Walker offers advice for creating a mobile DJ business advertising campaign. In this amusing look back in time, DJ pioneer Roger Squire shares the story of setting up his first London DJ booking office in the swinging 60s. Originally a mobile DJ whose roadshow was featured in an early issue of Pro Mobile, Ben McCarthy has since grown his Leicestershire business into an incredibly successful production company. To tell us more, Ben joined Pro Mobile’s Greg Cartwright for a chat about his successful journey so far. Part Ten: Being A DJ Is Not Easy! Jim Cerone 'The Perfect Host' concludes his ten part article series covering the 'senses' that all successful DJ hosts must have. Derek Pengelly, Greg Cartwright, Harry Kilb, Ian Forest, James Humphrey, James Mackie, Jim Cerone, John Dixon, Justin Banwell, Mark Walsh, Richard Lee, Richard Linton, Roger Squire and Toby Oakley. ADJ, BPM, Cameo, CHAUVET DJ, CRS1, dB Technologies, DJkit, DJ Event Planner, DJ Guard, DJ Superstore, DMC, Equinox, Fabtronic, FBT, Gemini, IMG Stage Line, JTS, Kam, LD Systems, LiteConsole, Mastermix, NovoPro, [Opti], Phase One, Pioneer DJ, Proel, Quiz Supplies, RSDmusic, RCF, Showtec, Sushi, Terralec and Yamaha.